After Jacob Vaughan had won the Perfs Pedal for his new team Canyon DHB, we had a chat with the former Lotto Soudal Under 23 rider about the race where he and Alex Paton were the key riders for the five man team in the season opener. “The team said it was between me and Paton but I wasn’t sure how I would be going but I think the race in Mallorca helped me form wise.” There was a lot of pressure on Jacob’s young shoulders to win the race with a lot of people tipping him for the win including his own teammates. 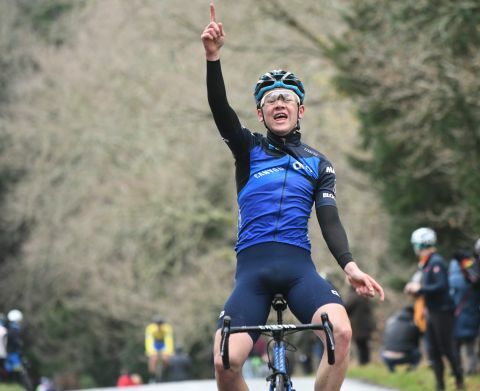 Asked what his goals were now going from an under 23 team and into a British UCI Continental one, Jacob replied “It is a step up for me and our race calendar is similar with the Holland Cup and all the UCI races there and I’d love to get a podium in a UCI race this year. The team have also entered a lot of Under 23 and Under 25 races this year so we’ll get to do them too which is great”.